Stinging nettles, more commonly called nettles, grow wild in most parts of the US, popping up in woodlands, rich soils, partially shaded areas, and along river banks. Although there are many different species, they all have similar health benefits. But that’s not all they have! Nettles are known for the stinging hairs located along the stems. If you try to pick them with bare hands, you’ll feel a very unpleasant burning, with redness and skin irritation. However, once picked, you can remove the leaves, chop them (keep wearing gloves) then cook them in the way you would prepare any leafy green vegetable. Once cooked, the stinging action is deactivated. They’re tasty creamed, tossed with other vegetables, or added to soups and tomato sauce. I used to pull nettles from my gardens in New York, but I must admit that I didn’t cook them. If you want to use those from your garden, be sure to harvest them before they bloom. For those of you who don’t have access to the fresh herb, no worries! You can buy it in a tincture, capsules, or tea. 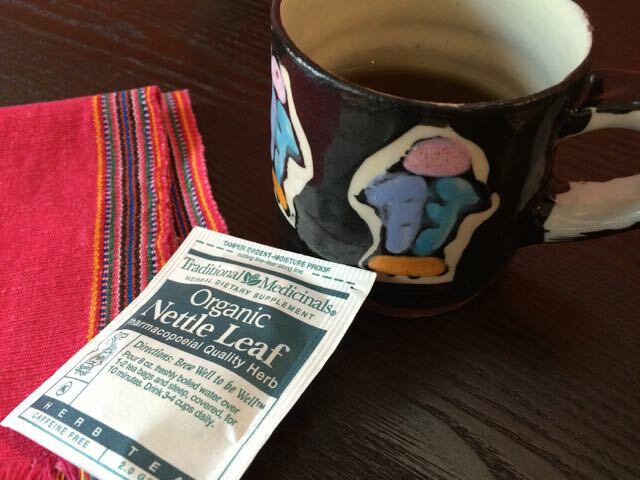 Nettles are one of the top spring detox herbs, and they are often recommended to help detoxify and support your liver. 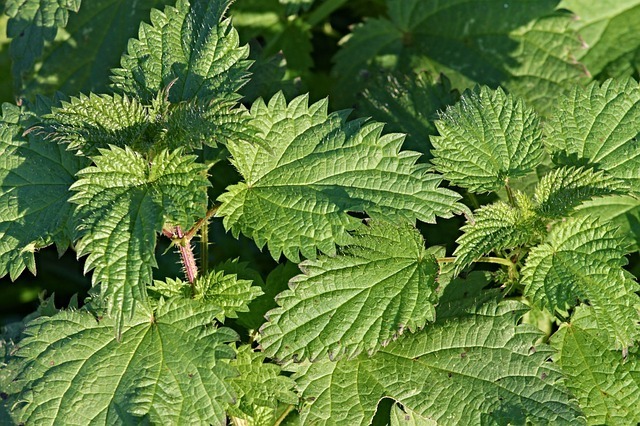 Nettles also help relieve allergies, and research has shown that nettles act as a gentle antihistamine. Most studies use freeze-dried herbs in capsule form, so you probably need to take the concentrated capsules or tincture to get the best effects. It purportedly provides almost immediate relief from allergy symptoms when combined with goldenseal in a tincture. Nettles can be used year-round as a tonic that benefits the whole body, but primarily the stomach, lungs, and urinary tract. It has been used for centuries as a restorative for chronically ill patients. It’s one of the most nutrient-dense herbs, with a high concentration of calcium, magnesium, and iron, along with smaller but still beneficial amounts of manganese, potassium, phosphorus, iodine, silica, sodium and sulfur. Because of this, it strengthens bones, nails, hair, and skin. This nutritious herb is a great source of chlorophyll, vitamin C, beta carotene, and B vitamins. Nettles contain more protein than any other herb—about 10%—in easily digestible amino acids, making it a useful food for vegans and vegetarians. Due to its high levels of tannins, it also has astringent and diuretic properties. It can reduce water weight, puffiness, and heavy menstrual bleeding. The iron content helps prevent anemia if you suffer from heavy or frequent periods. Don’t feel like causing yourself intentional or unintentional pain handling the fresh herb? Then sit back and have a cup of nettle tea. Some people like the grassy taste, but if you don’t, you can easily mask it by combining it with a tea you prefer, like mint, ginger, or chai. I’m sipping a cup right now to help me get through this spring allergy season. Copyright © by Bobbi Mullins, originally published April 28, 2015. Brill, S. and Dean, E. Identifying and Harvesting Edible and Medicinal Plants. 1994. New York: Harper. Groves, M. Herbal Super Infusions to the Rescue! 2015. Herb Quarterly. Groves, M. Medicine Chest: Herbs and Seasonal Allergies. 2015. Herb Quarterly. Copyright © by Bobbi Mullins: All articles and recipes on this website are original, unless otherwise noted. Permission must be obtained to use any of the material. I am not a medical doctor; therefore, I do not diagnose or prescribe. All communications represent my opinion only and will be a reflection of the Model of Empowerment where my role is to educate and empower the client to take active participation for his or her own health. The information provided on this website should not be used as a substitute for advice from your physician and is not intended to diagnose, treat, cure, or prevent any disease. It is your responsibility to consult your physician about any changes you choose to make in your diet or exercise. The statements herein have not been evaluated by the Food and Drug Administration.